Once upon a time, Marc “Coop” Cooper was an Electrical Engineer and Hospital Administrator who decided to learn how to make super premium ice cream. 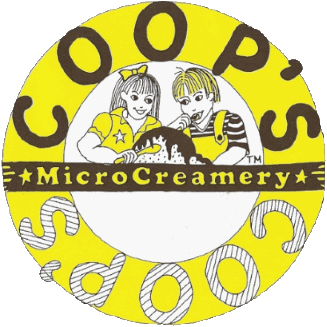 After owning and operating two popular retail ice cream shops for 25 years, Coop set out to create his own brand of handmade ice cream and products in Spring 2009, and COOP's MicroCreamery was born. Wanting to keep his staff busy in the off-season, Marc started playing around with a hot fudge recipe. The resulting concoction became so popular that in 2011, the hot fudge production split off from the ice cream to become its own business. At COOP's, we make the best specialty desserts we can, using only the finest ingredients available from suppliers we know--never anything unpronounceable. Our products are all made from scratch in small batches: on every jar you'll find the initials of the person who made it.